[00:06:55] <andypugh> Well, all it is actually complaining about is XKB "failed to configure keymap"
[00:09:33] <andypugh> Aha! That means the root partition is full! [00:17:30] <andypugh> Anyone want that replacement SSD that I ordered? [00:20:32] <Jymmm> The funny thing is that if he just dd'ed the drive to a file he would have found he was out of space hours ago. [00:25:53] <andypugh> If I could have done that, I would ahve. [08:43:56] <Valen> given the super low torque, any thaughts on replacing them with a lower/cheaper grade of bolt? [10:43:03] <Loetmichel> i know this from a electronic parts supplier in germany: small room , about 5 by 8 meters with a 8 meter counter cutting int roughly in half. [10:43:24] <Loetmichel> one side for the customers, other fpr 4-6 old guys in lab coats. [10:47:29] <Loetmichel> (thanks to the many girls in the storage area packing the goods for mail Delivery AND the goods for the "shop"
[11:57:08] <Guest770> Anyone know where to find english mocca GUI's? [12:00:37] <Jymmm> JT-Shop: Got Garage Door? [12:44:55] <Jymmm> jthornton: did you see the video? [13:39:57] <jdhNC> cheap and should work fine with a p-port? [13:53:45] <malagant> awallin_, do you know what's the problem? [13:54:54] <awallin_> sam's laser faq ? [13:55:52] <malagant> there is no loose wires or anything like that..
[13:55:57] <awallin_> so did it work before? [13:59:42] <Loetmichel> and tha arcing looks like some destroyed isolator. [13:59:56] <Loetmichel> can you tell whre the arc is flying TO? [14:00:08] <Loetmichel> one point will be the tube contact, and the other? [14:00:52] <malagant> I so use grounded power cable..
[14:04:14] <malagant> could it be that the another cable (blue one) isn't grounded goog enough and current doesn't flow thru the tube? [14:06:16] <malagant> I'll upload some pictures, wait a sec..
[14:08:39] <skunkworks> I should really run the released version of emc now. I think everything that was modified is now in it. [14:11:21] <skunkworks> neat - is that around 100w? [14:12:11] <awallin_> from the video it looks like the arc is from the red wire to the blue enclosure/casing ? [14:13:45] <Loetmichel> the blue wire looks very thin isolated. [14:14:23] <skunkworks> we had a 1kw laser go down because the hv wire fired to the case. [14:15:50] <Loetmichel> malagant: as a search for the fault I would fist look behiond the foam at the red end for some charring. [14:17:54] <Loetmichel> do you have some photos of the end after the arc had occured? [14:19:18] <Guest770> Anyone know where to find english mocca GUI's? [14:20:49] <skunkworks> Guest770: Have you checked the forum? I have not been keeping up with it. [14:21:56] <malagant> my guess was that the foam was there for just because of the transport..
[14:22:43] <Loetmichel> maybe only 0,1mm black spots. but it will! [14:23:29] <malagant> Loetmichel, ok, but it's not the point :D what's the problem? blue wire isn't going where it should? [14:24:58] <skunkworks> grommit: for grins can you try a sim config? [14:25:24] <malagant> Loetmichel, ok, cannot do it before tomorrow..
[14:29:34] <skunkworks> that is what I would think too. It seems to die after trying to load axis. [14:31:10] <awallin_> lot's of things written about "X Error of failed request: BadLength"..
[14:35:57] <grommit> I can relate, believe me! [14:42:27] <skunkworks> awallin_: ever get back to your extruder? [14:43:50] <awallin_> skunkworks: not really... it sort of worked, but we don't have room for the big router-table. a desktop xyz-platform like the makerbot or similar would be more protable. I guess there would be some incentive to develop g-code generators for 3d-printing also then..
[14:44:29] <grommit> After reboot I am back working again. [15:31:02] <awallin_> I guess the mirrors on the end of the laser-tube are not adjustable? if doesn't start to lase it may be like Loetmichel said, the voltage rises so high you get arcing. [15:31:26] <awallin_> lasing requires the right gas inside and good alignment of the resonator mirrors, clean mirrors, etc. [15:48:30] <malagant> A2Sheds, what it means? [15:49:28] <A2Sheds> what is that conical piece made from that the red wire enters? [15:52:25] <A2Sheds> is that where the arc is from? [15:53:04] <malagant> should I isolate the wire's end somehow? [15:54:27] <A2Sheds> the problem is if you try to fix it will they honor any warranty? [15:54:54] <A2Sheds> or do you still care about a warranty? [15:55:51] <malagant> yeah, I think I'll first wait what the seller says..
[16:02:43] <Loetmichel> anyways: to use the tube without the watercooling WILL damage it. SOOON. [16:03:24] <Loetmichel> so please make the water cooling operable before further testing. [16:08:45] <Loetmichel> malagant: do you have some neutral (no vinegar) silicone handy? 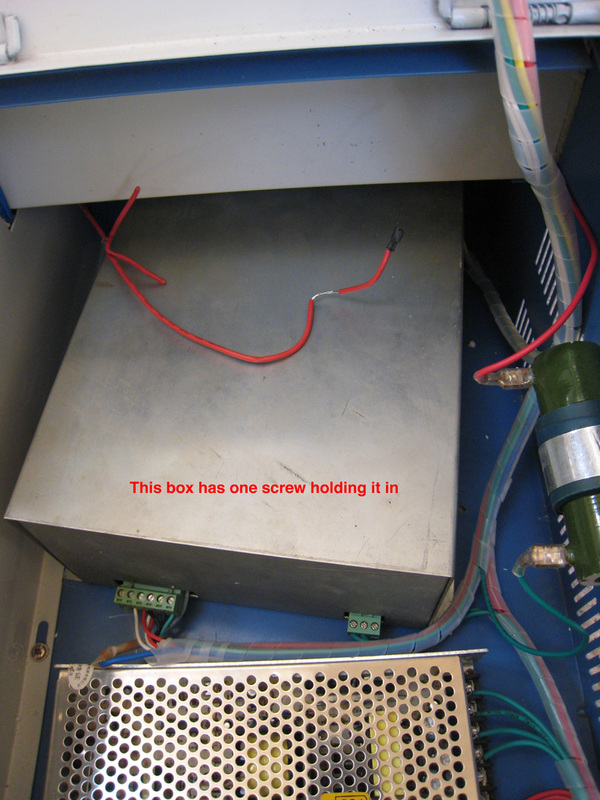 [16:09:48] <Loetmichel> you COULD try to insulate the connection of the red wire to the tube GENEROUSLY and without air bubbles. [16:47:54] <ktchk> Any tb6560 user? [16:49:51] <Loetmichel> malagant: just a question: how much was the entire unit? [17:09:44] <ktchk> Hi any one using the tb6560 board? [17:16:32] <lumberjack_jeff> update 2.4.7 appears to have broken my install. "X Error of failed request: BadLength (poly request too large or internal Xlib length error)"
[17:20:13] <Loetmichel> malagant: but the tube is not igniting? [17:21:58] <lumberjack_jeff> jtshop, did you fix it? [17:24:51] <JT-Shop> 09:44	grommit	After reboot I am back working again. [17:29:08] <lumberjack_jeff> jtshop, I have ubuntu lynx (10.04 lts). Same advice? [17:37:10] <jt-plasma> emc/iotask/ioControl.cc 762: can't load tool table. [17:50:54] * JT-Shop wonders how input.0.btn-trigger changed to input.0.btn-joystick ???? [17:58:44] <JT-Shop> but I fingered it out..
[19:00:54] <ktchk> emc2 set up strepper the leadscrew mm/rev effect the pulse rate at max speed why? [19:05:18] <Connor> Cap on the encoder? Wasn't suppose to be their? [19:06:08] <Connor> I don't have any on mine.. but, I have have different kind of encocder. [19:18:24] <Danimal_garage|2> then you have your microstepping set wrong, or your timing is off. [19:32:07] <Danimal_garage|2> yay, clean machine! [19:44:02] <Tom_itx> ok who has the coolest tool touch pad? [19:44:51] <Jymmm> Tom_itx: Apple, but it only works on a mac. [19:45:07] <Jymmm> Tom_itx: or did you mean touch off? [19:45:39] <Jymmm> JT-Shop: He likes beer too! [19:45:47] <andypugh> Hmm, you could probably use an iPhone as a touch-off plate. What could possibly go wrong? [19:47:54] <Danimal_garage|2> i like my machines used. [19:48:19] <JT-Shop> anyone use Visual Mill with SolidWorks? [19:48:25] <andypugh> Jymmm: Shiny! Must Buy! [19:48:47] <Jymmm> andypugh: My gf likes it, I like my trackball. [19:50:10] <Jymmm> andypugh: It's funny, I have two trackballs next to each other and when ppl come over they always have a bewilder look on their face when they see them. [19:50:57] <andypugh> Oddly, I have such a look on my face now. [19:51:19] <Jymmm> andypugh: Billards cue ball sized, not wimpy little things. [19:51:44] <Jymmm> andypugh: One os for primary desktop, the other is for the KVM switch. [19:53:12] <Jymmm> JT-Shop: When you upgrade SW from one version to the next, does it deactivate the older version(s)? [19:54:31] <Jymmm> JT-Shop: So SW2008 still works? [20:17:55] <emc_rules> I cant launch hal configuration within axis anymore. but hal meter and scope work fine. Any ideas? [20:22:02] <andypugh> emc_rules: Err, no. That's rather wierd. [20:22:23] <andypugh> emc_rules: It is a standalone application. [20:22:35] <andypugh> Try "halshow" in a terminal window with Axis up and running. [20:26:30] <andypugh> JT-Shop: Do you have a 7i76? [20:27:03] <andypugh> Has PCW indicated that the spindle connector is not as indicated in the manual? [20:28:20] <andypugh> He had the power connector wrong. [20:37:21] <andypugh> Yes, if you connect that way (assuming 1 is the bottom pin) then bad things happen. [20:42:31] <andypugh> None of the other combinations work either, but that could be the driver. [21:11:52] <ktchk> Danimal_garage|2: I did check the microstep setting the microstep and leadscrew pitch does not match the turns the motor run. [21:21:33] <elmo40> emc_rules: afternoon. long time no chat. how goes it? [21:24:35] <Danimal_garage|2> ktchk: is the error the same every time? does it repeat, and get progressively off in the expected increments? [21:27:29] <Spida> is there anythign I should read as an intro to milling when I want to buy/build a cnc-mill? I have a rough understanding of the mechanics involved, and I have occasionally used manual mills (missing a bunch of knowledge and experience there). anything I should read first? [21:30:06] <Danimal_garage|2> the machinist's handbook if you're really dedicated! [21:36:30] <andypugh> 11 microsteps? That's not right. 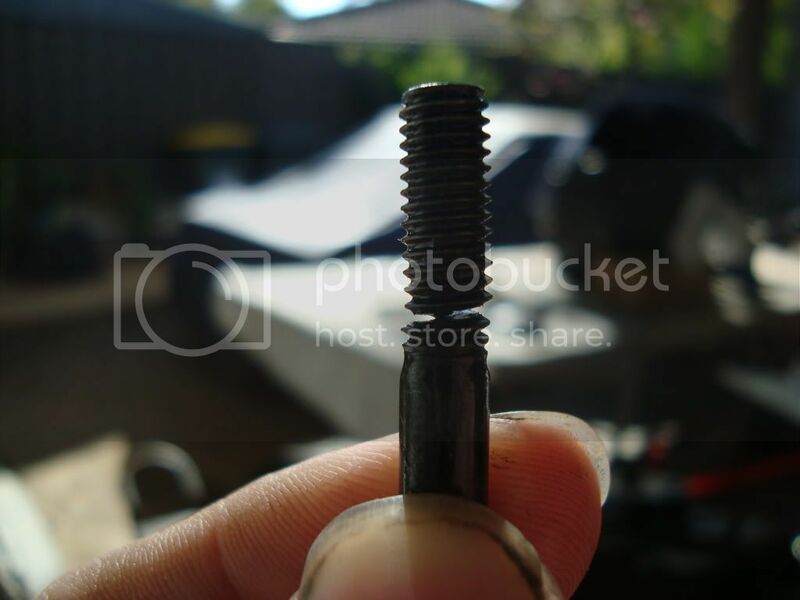 [21:40:34] <andypugh> ktchk: More likely to be that the leadscrew pitch isn't what you think, or the reduction ratio is different. [21:40:55] <andypugh> TB6560 is too dumb to get that sort of thing wrong. [21:41:25] <Tom_itx> is andy back to his ole self now? [21:46:10] <andypugh> Yes, it was a full drive. Not that _anything_ suggested that. [22:10:02] <elmo40> Spida: have you machines anything? wood, metal? [22:12:18] <andypugh> Anyone know when PCW gets back? [22:17:01] <elmo40> hasnt been here since when, the 13th? [22:43:18] <andypugh> Bolt it to the ceiling, then the swarf will fall off. [22:44:01] <andypugh> Line the floor in plastic. [22:45:11] <andypugh> Don't give me problems, give me solutions! [22:47:07] <andypugh> There you go! Or use something that dries away, like acetone. [22:49:12] <Jymmm> Nah, use denatured alcohol. 190 Proof, white flame, ignites with just one spark, and hotter than hell! [22:50:00] <Jymmm> jdhNC: LOX is just too fun to play with. [22:55:35] <Jymmm> Oh, in that case use pure O2 air cooling, no need for all that inert gas like nitrogen. [22:58:52] <Jymmm> It's weird, ignited magnesium explodes when in contact with water, yet is used to start a camp fire in the rain - go figure. [22:59:51] <Jymmm> ok, bbl.. food run! [23:01:25] <Danimal_garage|2> too late for lunch, too early for dinner. [23:05:48] <Danimal_garage|2> thats cool. that would make great fuel! [23:06:52] <Danimal_garage|2> i'm guessing it's not very plentiful? [23:08:46] <Danimal_garage|2> how many bananas had to die to get the potasium needed for that clip? [23:17:47] <elmo40> any recommendations on a laptop? i was looking at a Lenovo with the nVidia Quadro cards. [23:17:58] <elmo40> new position in the job. [23:18:21] <Danimal_garage|2> what do you do now there? [23:20:10] <andypugh> Macbook.CNC-milled case, looks the part. [23:20:41] <Tom_itx> hell that's today! !